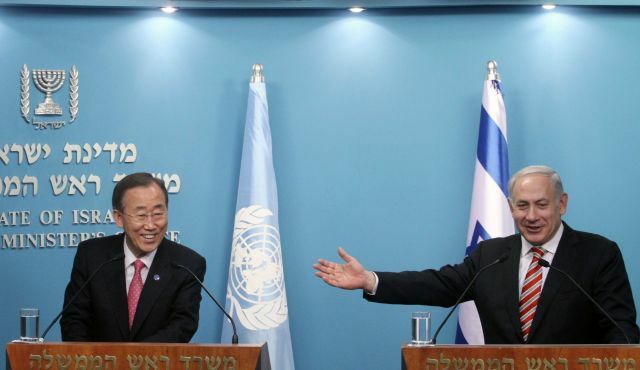 Netanyahu regime ‘leaks’ phone conversation with UN’s Ban Ki Moon to shame him over decision to attend Non-Aligned Movement Conference (NAM) in Tehran, Iran. Pulls “antisemitic” card. Haaretz did not clarify that the statement Netanyahu is referring was both translated incorrectly and taken purposefully out of context (here and here). Haaretz also fails to mention that accusations against Iran of being “anti-Semitic” are ludicrous at face value, as the Syrian Arab Republic (Arabs being Semites) is one of Iran’s closest allies, while the largest population of Jews in the Muslim World resides peacefully in Iran (and here). Netanyahu’s “leak” attempted to paint the NAM conference, involving representatives from well over half the world’s population, as an “illegitimate” exercise in international diplomacy hosted by a “belligerent,” “bigoted,” and “backward” nation. Image: NAM members are in dark-blue, observers in light-blue. Collectively the conference brings together representatives of over half the world’s population. Israel’s Netanyahu government has attempted to intimidate and shame UN Secretary General Ban Ki Moon from attending the conference in hopes of undermining it, and specifically this year’s host nation, Iran. In reality, Netanyahu’s “leak” of his phone conversation with the UN’s Ban Ki Moon is a public relations stunt intended to play on whatever credit there remains for the “anti-Semite” card and Iran’s portrayal as the premier “state sponsor of international terrorism.” This is in part to undermine Iran, this year’s host nation, as well as sabotage an anticipated follow-up to the highly-successful “International Consultative Conference on Syria” held earlier this month. Unfortunately for Netanyahu and his increasingly tenuous legitimacy, his government’s support and role in Western operations undermining the peace and security of neighboring Syria through the use of listed terrorist organizations including the Libyan Islamic Fighting Group (LIFG), the Muslim Brotherhood, and Al Qaeda itself, instead place him amongst the premier state sponsors of international terrorism. His nation, which should be enjoying standards of living and prosperity amongst the highest on Earth considering Israel’s extensive human resources, is facing austerity and economic hardship as the collective talent and potential of the Israeli people are squandered in the pursuit of armed corporate-financier hegemony instead of peaceful progress. The UN, which should be ashamed for many other reasons, including its failure to categorically condemn the West’s violent subversion of Syria via listed terrorist organizations, has no reason to be ashamed for attending the upcoming NAM conference in Tehran. Netanyahu on the other hand, has exposed himself and the interests he represents as both connivers and thugs attempting to intimidate diplomats from attending the conference. Western corporate-financier oligarchs have done more to send both Americans and Israelis to their deaths than any combination of suicide belt-wearing, Kalashnikov-waving “terrorists.” The “War on Terror” is indeed a fraud, and Israel’s government has masterfully played a pivotal role – maintaining a strategy of tension to keep its own people in perpetual fear, while keeping their perceived enemies in perpetual and absolute rage. When enemies are difficult to find, the government of Israel and its corporate-financier backers upon Wall Street and in the city of London create them, including the Muslim Brotherhood, Hamas (and here), and Al Qaeda. The result is a nation at constant war, with an inexhaustible supply of enemies in an unending conflict giving the interests of Wall Street and London – the very interests that created the modern state of Israel to begin with – an excuse to remain perpetually engaged in the Middle East with a military encampment the size of a nation at their constant disposal. Augmenting this camp are the Israeli people themselves, just as lied to, manipulated, and kept in constant fear as their counterparts in the West to keep the rank and file of the Israeli Defense Force (IDF) as full as Wall Street’s American Armed Forces or Europe’s NATO foot soldiers. The Israeli people are no less well-intentioned, talented, or full of potential as any other people on Earth, but they are likewise just as susceptible to being indoctrinated, misled, and terrorized into taking a course of action in no way beneficial to themselves or their nation. The Israeli government does not pursue a foreign or domestic policy conducive to its own self-preservation, let alone its prosperity as a nation. Its constant warmongering, meddling geopolitically beyond its borders, and the creation and perpetuation of its alleged “enemies” have indeed killed more Israelis than any “terrorist.” The Israeli government and the corporate-financier interests they represent are the Israeli people’s worst enemy. It would be wise for both the Israeli people, and those who perceive themselves to be “enemies of Israel” to remember that and make a clear distinction when moving forward.